James Teh fixed a really annoying accessibility bug where search suggestions were interfering with the focused element. We’re officially launching a new privacy tool called Firefox Monitor. You can read the official announcement and a bit of behind the scenes. Focus for iOS 7.0 went live last week, Focus for Android 7.0 with GeckoView is scheduled for release on October 2. Florian has been landing some massive improvements to the new about:performance. To try out the new page, flip the dom.performance.enable_scheduler_timing pref to true, and restart your browser (or you’ll get crashed). Please file bugs in Toolkit :: Performance Monitoring. Instead of displaying ‘dispatches’ and ‘duration’, the values are combined into something (labelled “Energy Impact”) that users can better understand, with “High/Medium/Low/None” categories. Sort order is more stable, and subframes/workers have values. It’s possible to select a row. A double click will select the tab. Tarek Ziade is making good progress on counting WebExtension activity in frame scripts, and is experimenting with collecting memory information per tab. A grab bag of Web Payments improvements! The team has been making great progress, and they’re almost ready for user testing. We now support all countries 🌎 in form autofill preferences for use by Payment Request. 💳 Improved credit card form layout and added placeholder credit card network logos. And, of course, improvements to the DOM API: implementing PaymentResponse.retry(), onmerchantvalidation and MerchantValidationEvent, and PaymentResponse.prototype.onpayerdetailchange. The second beta of Firefox for iOS 14.0 was sent to our TestFlight audience. We added support for thumbnail images on tabs. We now have a new component that protects user data using AndroidKeyStore. Our settings now have more support for WebView settings. Our engine component now supports fullscreen mode, clearing browsing data, and intercepting errors. We added support for processing ACTION_SEND intents. The new sync-loginscomponent was introduced. We added initial documentation for our browser-session component. Lockbox iOS 1.3 went live Tuesday September 18th. Read up on the release details. With iOS 12 you can automatically fill your usernames and passwords from Firefox Lockbox into apps and websites. The team is running an experiment with the new single overlay onboarding experience in Release. The Contextual Feature Recommender, a doorhanger that recommends add-ons, is now in Nightly, and will run as an experiment in Beta next week. We now show the logo and wordmark when only the search panel is enabled. Many pieces for the new userScripts API landed. See the tracking bug to follow them all. The delayed background script startup optimization is now enabled on Fennec. Location bar focus is now handled properly when extensions open new tabs. A glitch with uninstalling themes was fixed. Links in extension sidebars now work properly. We no longer get a yellow-screen-of-death if a language pack is updated from an unpacked version or removed from disk. The team is working on a bookmarks 📚 and history 🕒 Android components, based on the Places schema. We’re currently building a command-line awesomebar demo, using Desktop’s autocomplete algorithm. We have a syncable logins store, based on the iOS implementation, and an Android component that’s now integrated into Lockbox 🔒. There’s a prototype of porting the synced bookmark merger on Desktop to Rust 🦀. The patch has a minimal mozStorage Rust wrapper, and a mozISyncedBookmarksMirror component implemented in Rust. The merger can run off the main thread, unlike JS. Myk has also been working on an XPCOM component for rkv 📦. Check out the latest Browser Architecture Newsletter and the XUL/XBL Replacement Newsletter to read about what everyone’s been working on! Arai’s work to massively cut down DevTools opening delay on script-heavy pages by fixing a 5 year old bug to add Debugger.findSources. This removes a 1s hang when opening the Console on Gmail. ESLint is now enabled for editor/. Picked up performance improvement from eslint-plugin-html. Removing the --disable-nodejs flag is still planned, but no longer a blocker for making Node available to select moz.build files. Up next: beta support for moz.build files, use for JSX transpilation by the debugger team, ESLint integration. Has sorted out an Nvidia bug with client storage that was causing some really strange graphics artifacts on macOS. Patch is reviewed, hopefully landing soon. Removed some InitOSFileConstants’ main thread IO. This is a qf:p1 targeted for Firefox 64, so it’s great to see this coming along. Unfortunately, it’s unlikely that all of InitOSFileConstants will come off of the main thread, but some is better than none! dthayer will be filing a follow-up bug for the rest. Starting to look into Document Splitting for WebRender. This should isolate the updating of the browser UI from the web content, which should be more efficient. Fixed a bunch of tests. Recent trypush (and an earlier one with more tests/platforms) indicating remaining work will likely take at least another few weeks – probably 5-10 other test issues to sort out. They often don’t reproduce locally, and seem to largely be Linux-focused. Working on a qf:p1 for removing a layout flush when focusing the URL bar. Slowly making inroads here, but needing to spend time untangling how focus causes flushes only some of the time. Removing the layout flush for Tabs in Titlebar proceeding apace. Have it looking good on macOS, Linux, Windows 10, and Windows 7 “aero”. Need to fix up Windows 7 non-compositor, and then I can have this up for review. Removed the toolbar.toolbox XBL property as a dependency. Tested the background process priority manager on the 2018 Quantum Reference hardware, discovered a tab switcher bug, and got that fixed and uplifted. This caused mconley to file a bug about how the compositor seems to have more information than it’s letting on. Working on eliminating CPOWs from WebProgressChild messages. This will hopefully unblock the separate content process for Activity Stream from landing, which will enable the ScriptPreloader work that imjching worked on a few months back that improves about:newtab loading time. Mac policy engine try builds available, and Mac admins already love it! Thanks to Stephen Pohl! Working on security devices, certificates, and generic prefs for 64. MSI installer work happening as well. Fission is our codename for the process-per-site isolation project. Conversation getting started around reusable React components for websites that fit the Photon UI specs. Screenshots: bootstrap removal should land this week 🤞, see the metabug if you’re curious! Bootstrap removal introduced Talos regressions that seem to be caused by unexpected storage init at startup. [standard8] General reminder that xpcshell-tests can use the Developer Tools for debugging. A new section has been added to the xpcshell-test page on MDN on how to do this. [mconley] I’m getting rid of contentWindowAsCPOW, contentDocumentAsCPOW, and the APIs that rely on them. Please don’t use these anymore. [johannh] The update to macOS Mojave breaks Firefox compilation unless you install header files manually. Then it compiles successfully, but you’ll have a black window unless you downgrade to the 10.13 SDK. There’s a dev.platform post, too. We now have support for Array<T> in XPIDL. That means that all these awkward entries can be converted to more maintainable API signatures. 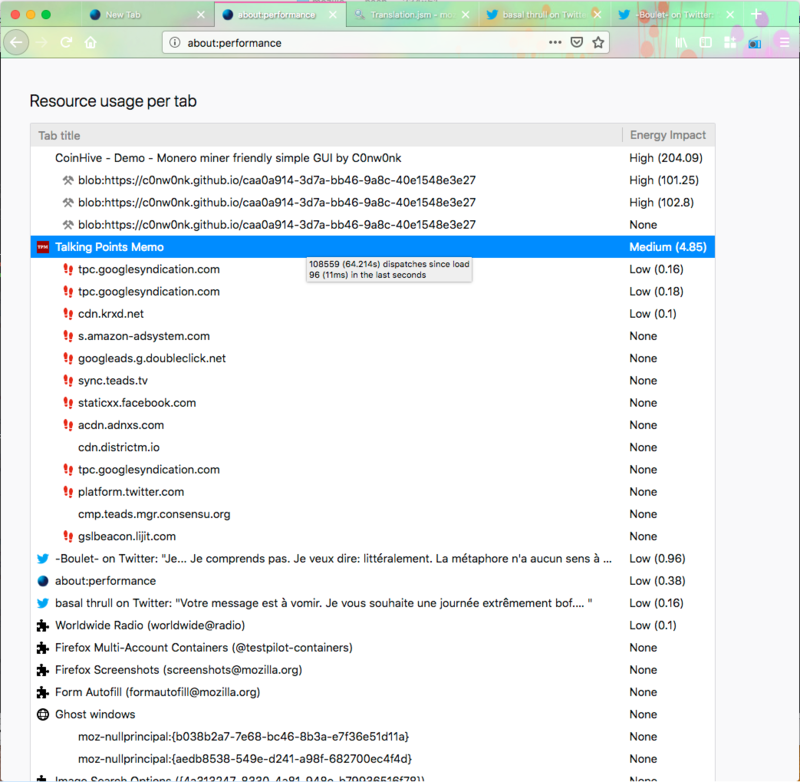 – Why does this page https://blog.nightly.mozilla.org/2018/10/02/these-weeks-in-firefox-issue-46/ still use 1.55 ? It doesn’t look like the page is doing anything and I am not even scrolling?